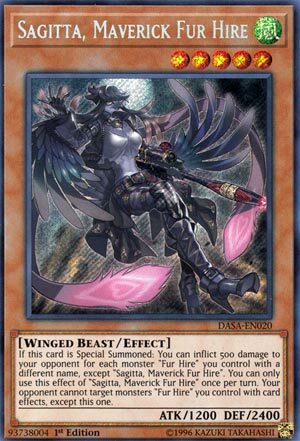 If this card is Special Summoned: You can inflict 500 damage to your opponent for each monster “Fur Hire” you control with a different name, except “Sagitta, Maverick Fur Hire”. You can only use this effect of “Sagitta, Maverick Fur Hire” once per turn. Your opponent cannot target monsters “Fur Hire” you control with card effects, except this one. Sagitta, Maverick Fur Hire is our Friday Fur Hire Card of the Day. It’s a Level 5 Wind Winged Beast type monster with 1200 Atk and 2400 Def. This is probably played at 1 in the deck because it would need a Tribute to Normal Summon. However, the smaller Fur Hires should bring this out of the hand for at least 500 Damage. Once per turn, if Maverick is Special Summoned by any means, you get to inflict 500 damage per different Fur Hire you control. This makes Soul Charge practically deadly. As a bonus effect, Maverick is the only Fur Hire you control that can be targeted once it hits the field. So it has a decent protection effect and good Def. Defense may not win games, but that first effect can really push things quite easily. Definitely worth running in the Fur Hire deck. Score: 4/5 Art: 4.5/5 Should have been Mave Rick or something. We end this week off with one more monster Fur Hire to look at: Sagitta, Maverick Fur Hire. Sagitta is a Level 5 WIND Winged Beast with 1200 ATK and 2400 DEF. ATK is bad for a Level 5, but DEF is solid. WIND is probably the second least supported attribute in the game, but Winged Beast has its benefits. When Sagitta is Special Summoned, you can inflict 500 damage to your opponent for each monster Fur Hire you control with a different name excluding Sagitta. Considering the spam capabilities of Fur Hire, you should be able to have enough on the field to deal at least 1000 damage. Burn is always nice, especially with the new time rulings. This is a hard once per turn effect, don’t know if that was necessary, but oh well. While Sagitta is on the field, your opponent cannot target monsters Fur Hire with card effects except this one. Any archetype having protection from targeting is solid, so Sagitta does have a role in this deck. Sagitta, however, isn’t the best high level monster Fur Hire, so 1 should suffice in the deck. Art: 4.25/5 One of the few amazing artworks Fur Hire. Let’s all take a minute to admire the artwork here…magnificent. Closing the week, we shift back to Fur Hire, in Sagitia, Maverick Fur Hire. (One of the better puns). Wind is meh, but Winged Beast is great (Icarus Attack anyone) while the 1200 defense is troublesome for Level 5, the 2400 defense is fantastic. So, he has a modest burn effect, 500 Damage per each different named Fur Hire you control when Special Summoned (that probably averages out at 1500 Damage, I’m assuming as easy as the swarm is, 2-4 for an average of 3 is a reasonable assumption). Also having to Special Summon to gain that is great, as you don’t have to waste a Tribute on something with 1200 attack. And the Special Summon lets you throw him out in defense mode. Your opponent is also prevented from Targeting any Fur Hire you control with card effects, other than this card. Makes the defense more of an asset, and while the protection is very single minded, it still helps the Deck, and can help protect the little and low level Fur Hires.